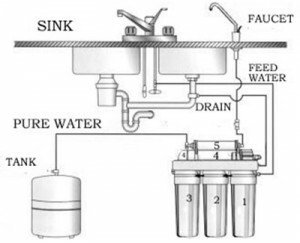 Reverse osmosis (RO) is a membrane-technology filtration method that removes many types of large molecules and ions from your home water supply by applying pressure to the solution when it is on one side of a selective membrane. The result is that the solute is retained on the pressurized side of the membrane and the pure solvent is allowed to pass to the other side. To be “selective,” this membrane should not allow large molecules or ions through the pores (holes), but should allow smaller components of the solution (such as the solvent) to pass freely. How Much Does A Water Treatment System Cost? Actually, water treatment systems cost surprisingly less than you might think. Give us a call at (480) 659-4942 and we can go over the makes and models we offer and their prices.